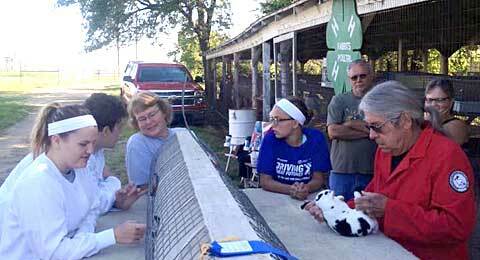 Spectators and exhibitors observe judging during the rabbit show at the 2015 Overbrook Osage County Fair. Photo thanks to Frontier Extension District. 4-H club key: Burlingame – B, Carbondale Rustlers – CR, Clover Wranglers – CW, Lyndon Leaders – LL, Melvern Junior Highline – MJH, North Osage – NO, Vassar Blue Ribbon – VBR, Willing Workers – WW. Ribbon placings key: Purple-P, Blue-B, Red-R,White-W.
Information thanks to Gina Schultz and the Overbrook Osage County Fair Board.